Burns 30% LONGER than Traditional Tiki Torch Oil. Wick heights were low for maximum burn and minimal smoke/soot. Results will vary. Actually, our results were even better than stated. Wow! Finally an ODORLESS Base Tiki Torch Fuel. You will smell a hint of Eucalyptus, but the bugs can too which keeps them away. Based on customer feedback, we've been told the Eucalyptus actually does a better job of keeping the bugs away than Citronella. Independent Lab Tests Show Less Smoke and Soot. NEVER MIX FUELS as this will change the burning characteristics of Firefly Tiki Torch Fuel. 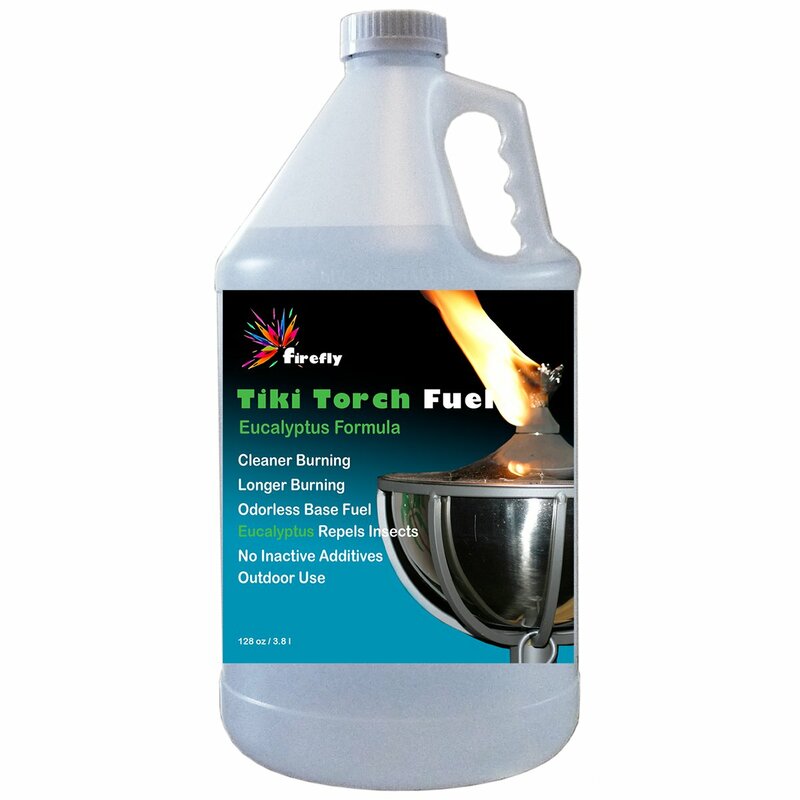 Size: 1 Gallon | Color: Eucalyptus Oil Formula Firefly UNCOMMON Eucalyptus Tiki Torch Oil by the gallon is very economical.In-house testing showed it burned 30% longer than common tiki torch fuelproducing less smoke and soot. The base fuel is odorless but there is a faintsmell of Eucalyptus which will help keep the bugs away. In our experience,Eucalyptus Oil outperforms Citronella as a more effective bug deterrent. Beyond the fact this is the next generation in tiki torch fuel, you canrecycle this 128 oz./gallon PET bottle. For your safety, our 128-oz. bottlefeatures a commercial-style with a childproof cap. Additionally, there are NOinactive ingredients, such as colorants, which reduce purity. And what about leakage during shipping? We electronically seal our bottles toprevent leakage and our packaging has been tested and approved by FedEx toensure the product gets to you in tip-top shape. Firefly Tiki Torch Fuel isfor outdoor use only. REMEMBER, Firefly Tiki Torch Fuel is for outdoor use only and wick heightmatters as it relates to the amount of smoke and soot output. We recommendkeeping your wick flush with the collar to reduce soot, smoke and conservefuel. KEY POINT: NEVER MIX FUELS as this will change the burningcharacteristics of Firefly Tiki Torch Fuel.